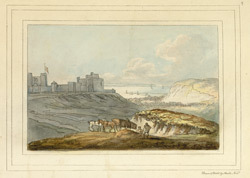 View of the castle and town at Dover in Kent. As this picture shows, the castle was perched in a commanding cliff top position, facing out to sea. Here the French coast is only 22 miles across the Channel, making the castle 'the very front door of England'(Matthew Parris). Unusually, the artist, etcher and publisher is a woman. Mrs Amelia Noel (1759-1818) was a drawing mistress who exhibited landscapes between 1795 and 1804. Kent was one of her favoured locations to draw, alongside the Lake District and Ireland.